* Prices do not include shippng charges. International shipping charges do not include Customs fees, import duties, tariffs, or VAT. Fil at Solo Dalas using his ARACOM PRX150 with his vintage Marshall amplifiers and his vintage Gibson guitars. Pedro Dias Costa with his '59 John Cruz Strat + '66 Super Reverb (Amp volume knob on 10) + PRX150-DAG attenuator. PRX150-DAG Model: Line Out Switching Potentiometer "Push/Pull Pot (Level Control Knob)"
Potentiometer Knob Pushed In = Equalized Line Out signal that emulates the natural high frequency roll off of a guitar speaker. Potentiometer Knob Pulled Out = Non-equalized Line Out, the raw sampled "non-equalized" signal from the amplifier. Added protection for the switches and knobs on the back panel. Unlike other attenuators, the S.R.T technology does not load down the speakers reactance, which allows your speakers to react and perform naturally throughout the attenuation range. The PRX150 with its S.R.T. technology provides highly transparent tone. Click Here for nearly 100 customer provided audio/video clips and hear for yourself. Uniquely allows 9 possible Input and Output (Amplifier to Speaker Cabinet) impedance combinations. Uniquely allows 16 possible Input and Output (Amplifier to Speaker Cabinet) impedance combinations. * No other attenuator offers our separate, selectable Input and Output impedance design. * No other attenuator offers the PRX150's Amplifier to Speaker Cabinet Impedance Matching Feature (patent pending). The PRX150 line of attenuators can truly handle the power of your "monster" 100 watt (quad power tube) amplifier that is actually putting out much more than 100 watts when cranked up. Unlike other power attenuators that "overheat" with a cranked up 100 watt amp. Also exclusive to the PRX150 line of attenuators is the Min/Max Toggle switch, that allows the user to select between two Variable Attenuation ranges, providing very fine and precise control of the variable attenuation. There are over 1,000 happy PRX150 attenuator customers throughout the world. The PRX150 is used by professional, semi-pro, studio and hobby guitarist in more than 25 countries. 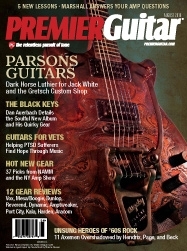 Click Here to read what guitar magazines and 100 customers have to say about their PRX150 attenuator. Click Here for approximately 150 PRX150 audio/video clips. 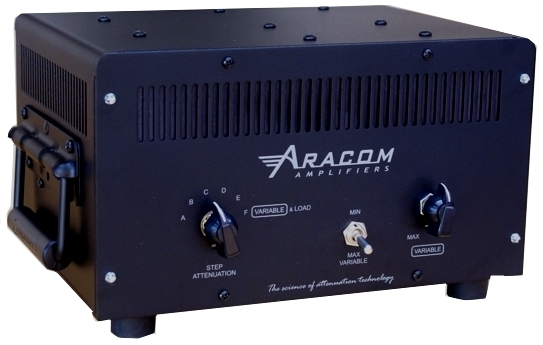 "Sonically, the Aracom PRX 150-Pro attenuator stayed very true to every amp I paired it with. My tone stayed stable as I lowered the dB level to its minimum amount (the variable control doesnï¿½t turn the sound completely off). Even super-quiet bedroom settings sounded very good and responded to picking and touch extremely well. This attractive, sturdily built unit would be a great addition to any guitaristï¿½s tone arsenal." "MAXIMUM TONE AT A MINIMAL VOLUME - For preserving your neighborsï¿½ sanity. Like a fine sports car, some amps need to be opened up before they hit their strideï¿½but the volume makes this an ongoing challenge for amp lovers and soundmen alike. The PRX took the loudest non-master volume amp we could find down to conversation level with none of the tonal compromises weï¿½ve noticed in the other units." Jimmy Herman is using his PRX150-DAG attenuator along with his Marshall plexi and Hiwatt 100 amplifiers live, on Carrie Underwood's 2013 Blown Away tour. Filippo F. Olivieri (Italy) PRX150-DAG "AC/DC" Demo. Attenuation level "F" (Variable Attenuation mode) providing approximately 20dB of attenuation, reducing his Marshall JMP(Plexi 50) amp's power out to less than 1 watt. Filippo F. Olivieri (Italy) PRX150-DAG "Boston (Party) Demo" Demo. Attenuation level "F" (Variable Attenuation mode) providing approximately 20dB of attenuation, reducing his Marshall JMP(Plexi 50) amp's power out to less than 1 watt. YouTube find: Nik Huber Dolphin guitar, cranked up vintage Marshall amp, PRX150-Pro2 (heavy attenuation), 4x12 cab. Thanks to Spiraless, a jazz-fusion instrumental rock band from France. YouTube find: 1959 Les Paul Reissue, 1974 Marshall SuperBass,PRX150-DAG, Marshall Model 1912 cabinet with Celestion G12M-65 Creamback speakers. Thanks to Marcello Prati. "If you have an amp that sounds great when you crank it up but itï¿½s just too loud for most playing situations, youï¿½ll want to know about the new Aracom Power Rox PRX 150-Pro amp attenuator. Designed for use with tube amps, this unit lets you reduce the level of a fully cranked head or combo." * Pricing and specifications subject to change without notice. Power Rox PRX150-Pro2 and PRX150-DAG are trademarks of ARACOM Amplifiers.